LOS ANGELES-Where is the love for the USC Trojans? This team can run the football. The can throw it pretty well. And when they need to do so, the Trojans can play a bit of defense. So far, that formula has worked pretty well for the Trojans the last couple of games. Well, you can make that the last four games. Now when they look up in the Pac-12 Conference South Division standings, USC finds itself just one game behind Utah and Colorado for the division crown. Yes, that same Colorado team they defeated during their current four-game winning streak. That same Colorado squad is ranked No. 23 in the latest AP Top 25 Football Poll. The Trojans are nowhere to seen in that poll. This looks like a very biased and misguided poll. Maybe after all the dust have cleared from USC’s 45-24 walkover of Cal at the Los Angeles Memorial Coliseum on Thursday night, the Trojans will find favor with poll voters in the upcoming weeks. Then again, with Oregon, Washington and UCLA on the schedule three straight weeks before closing out the regular season with a home finale against Notre Dame, the Trojans might benefit going under the radar. Coming into their conference division game against Cal, all the rave and buzz seem to be about Texas Tech transfer Davis Webb and the explosive Cal offense. The Trojans went out and called a spade and spade. Webb and the Bears’ offensive unit got handled by an overwhelming USC defense. Cal turned out to be the team we thought they were: frauds. Cal looked like they didn’t even belong on the same football field with USC, especially in the first half when the Trojans jumped out to a 21-0 nothing lead on their way to a 28-10 halftime advantage. And it should have been worst. If not for two sloppy fumbles deep in Cal territory, USC might have easily tacked on another two scores. 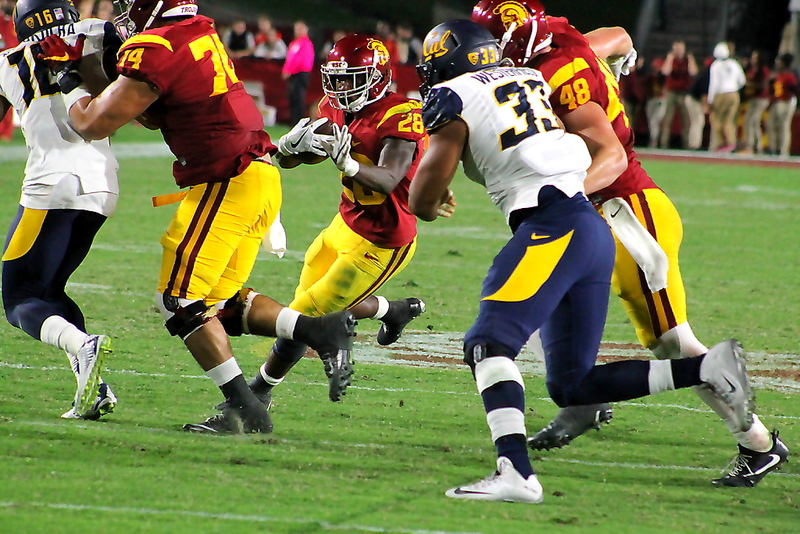 As it was, the Trojans still had a field day from their offensive juggernaut in the form of quarterback Sam Darnold and running back Ronald Jones II. Darnold went for five touchdowns in the air, while Jones dialed up the memories of great Trojans running backs of the past with his 223 yards on the ground. After looking like they went into hibernation in humbling defeats against Alabama, Utah and Stanford, the Trojans have let loose against everyone else standing in their way.